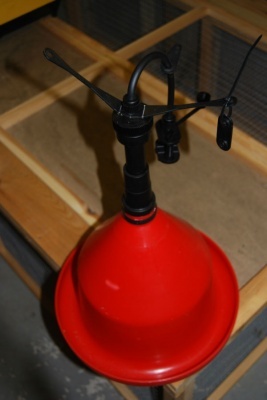 This simple hanging drinker is suitable for adult chickens, ducks and game birds. Each drinker comes with three metres of 6mm bore tubing, a saddle connector for 20mm or 25mm alkathene pipe and a hanging strap. The drinker works when water trickles from a low pressure header tank into the black stem at the top of the red cone. A series of holes allows the water to run down the outside of the cone and gather in the trough, where it is easy for birds to access it. The fact that this item is suspended above the ground means that its height is adjustable.The trough base is 32cm.